Driving the Dixie – The Chicago Heights Car Show! 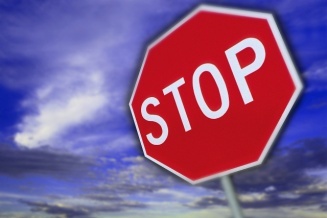 This year we are again hosting a stop on the Driving the Dixie route. Not only will we be at an amazing art gallery in a super-duper cool adaptive reuse of a historic building (stay tuned for that post…) BUT we will also be the Car Show stop for the vintage cars. SO, stop by between 10AM and Noon and enjoy! Thank you to the Union Street Gallery for hosting this great event! 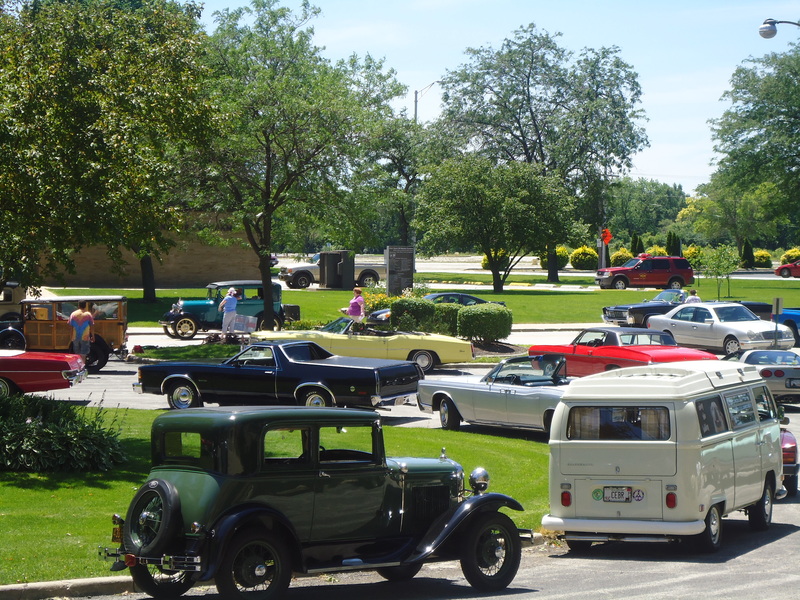 Many classic cars, ranging from Model A Ford’s to anything from the present, each year “Cruise the Dixie” (Highway) from Blue Island to Momence. 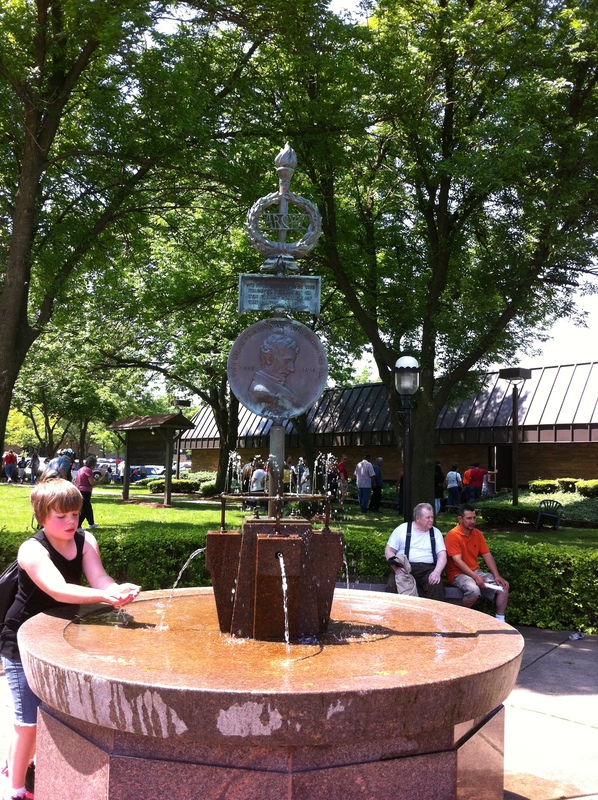 Stops are made along the way in several of the cities and everyone has a great time while celebrating a piece of history. The Union Street Gallery (1527 Otto Blvd.) An amazing adaptive reuse of a historic – local landmark – building! 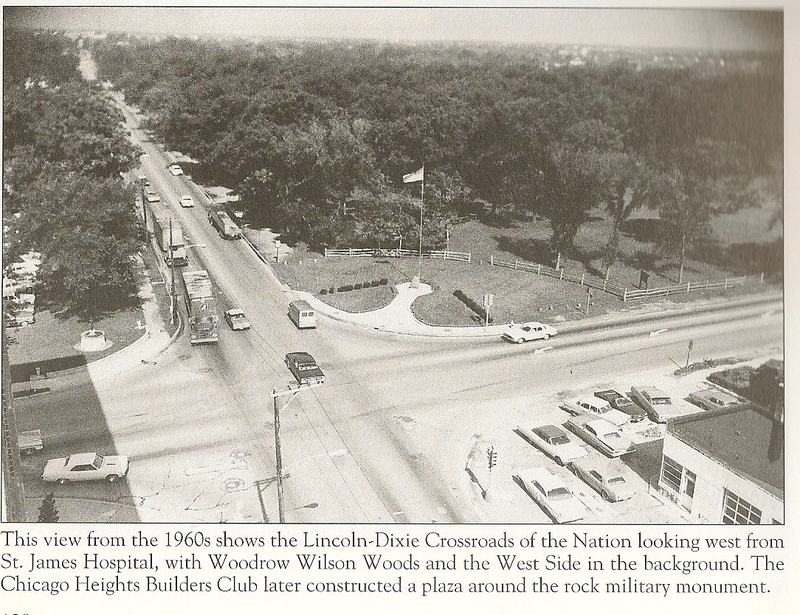 Inside the gallery will be refreshments and an exhibit on historic Lincoln Highway – which paired with Dixie Highway gives Chicago Heights her nickname – Crossroads of the Nation. 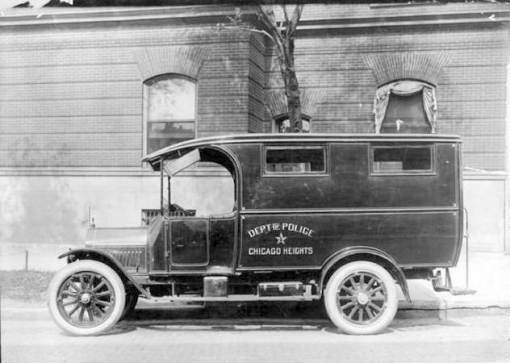 ALL are welcome to come on by to see the cars come through and experience some Chicago Heights history inside our fantastic art gallery. Welcome to Chicago Heights – and the “Crossroads of the Nation” – the intersection of Lincoln Highway and Dixie Highway (U.S. 30 & U.S. 1). Here is how Chicago Heights, Illinois, became “The Crossroads of the Nation”. Long ago, this area was home to Native Americans. Small family groups lived along Thorn Creek attracted by fertile hunting and a reliable source of water. As you may know, Chicago Road/Dixie Highway has long been a thoroughfare – it originated as the Vincennes Trace, and later, called Hubbard’s trail, for Gurdon Saltonstall Hubbard’s 1827 journey to Danville to gather men to defend Fort Dearborn from possible Native American attack. (A journey some said made Paul Revere’s ride seem easy!) It was a pathway used by Native Americans, early explorers, fur trappers and settlers. Absolem Wells is credited with being the first white settler in the area then known as Thorn Grove. He arrived in the spring of 1833 and built his cabin along the banks of Thorn Creek at 13th street – just about a block north of Rt. 30 (Lincoln Highway). The second family – the Browns – settled at the intersection of Hubbard’s and Saulk Trails ( a couple of miles south). The intersection became known as “Brown’s corners”. Their daughter – Lovinia- was the first child born to settlers here. It is interesting to note that the Browns were very friendly with the Potowatami who camped near them during their travels between their summer and winter homes (Canada / Iowa). In 1835, the Vincennes Trace was established as the 1st official state Road– the route between Vincennes and Chicago – now known here as Chicago Road. The boom began. In 1849 the settlement’s name was changed to Bloom. 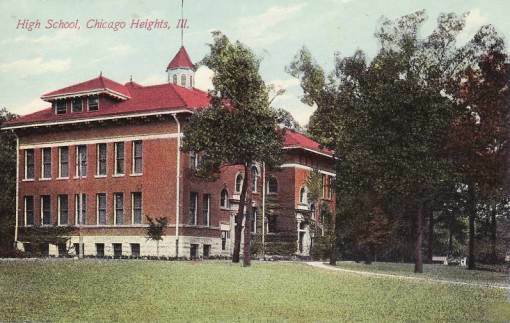 Chicago Heights was incorporated in 1892. By 1897 the area was served by 38 rail roads, state of the art shipping facilities and about 20 factories. In 1900 Bloom High School was organized and the City hall /Bloom H.S. building was built (site of parking lot between Rec. Center and library). The first of our four corners. Population reached 5,100 and in 1901 and we became an official city. By 1910 pop had reached 14,535. In response to the population increase and the number of industries in the area St. James hospital was opened and dedicated on Thanksgiving Day 1911 with 50 beds. (Several expansions later, it stands at the second corner) The saint at the corner is Our Lady of the Wayside. About 1912 Carl Fisher began his propaganda of the concept of improved highways and organized the Lincoln Highway Association. (Lincoln Highway Map) In 1915 he did the same for the Dixie Highway. 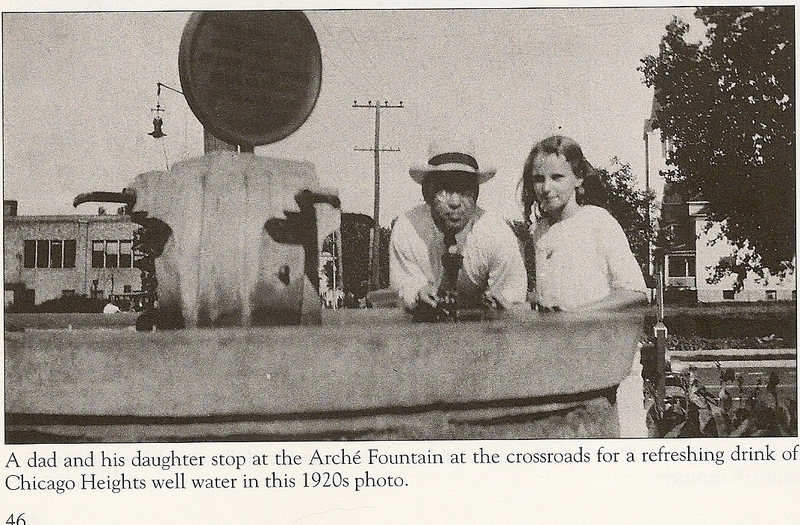 In 1916 the Arche Fountain (back to corner #1) was built to celebrate the intersection of the 1st two U.S. transcontinental highways – becoming known as “the Crossroads of the Nation”. Designed by George Ganiere and commissioned by the Arche Women’s Club which at the time was one of the largest Women’s clubs in the Chicago area. The torche is the insignia of the club. My favorite quote of the three on the fountain is “We find ourselves in the peaceful possession of the fairest portion of the earth. 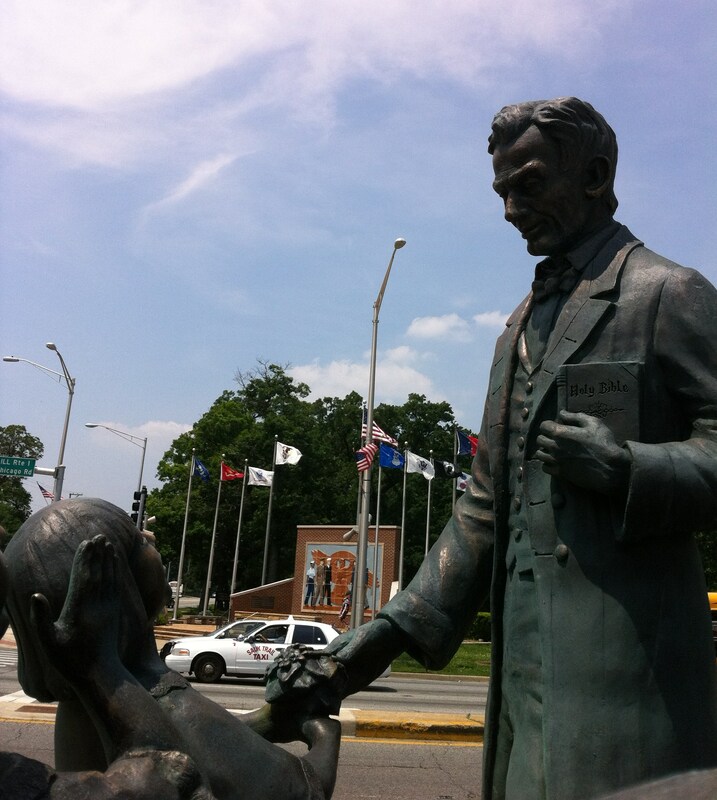 A Lincoln.” Today this corner is hardly peaceful, but the quote does give us a sense of the importance of this place. The fountain’s “purist artesian water” (uh, at the time that phrase was written it was well water ) has served to cool and quench many a pedestrian in this busy intersection. My daughters and I drank from it this past Memorial Day, my six-year-old proclaiming it the most refreshing water she has ever drank. To the north, the third corner, is The Mound. A memorial to those who have lost their lives in world wars, it serves as a place to honor our nation’s military. In the 1920s WWI vets posed for a picture here – at the time only three flags and stone monument were present. The Chicago Heights Builder’s Committee built the plaza around it sometime in the 1980s. 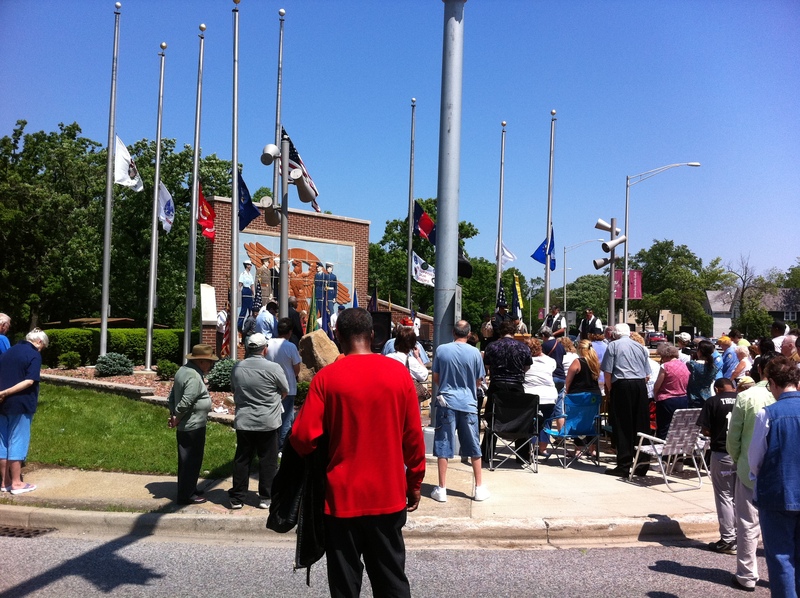 Yearly we as a community celebrate Memorial Day here and in 2010 the city unveiled the vintage polychrome terra-cotta wall – moved from its original location on the VFW hall built on E. Illinois Street. 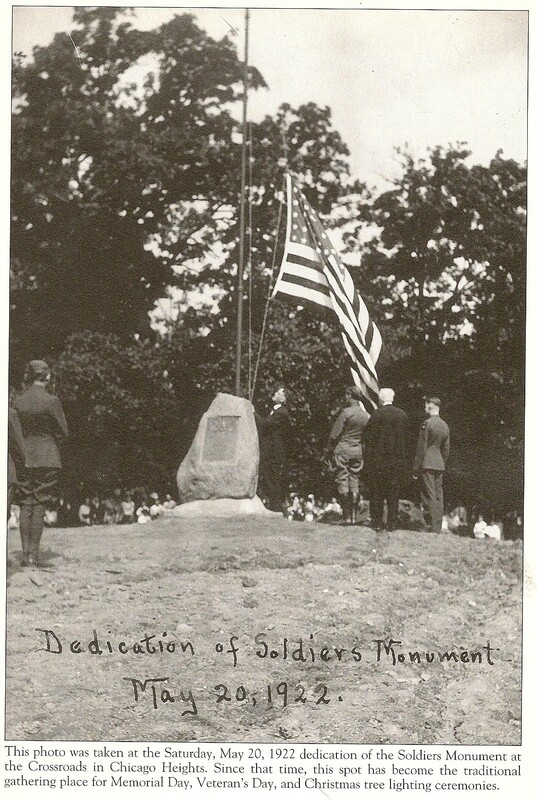 It’s placing here was made possible through a donation from the Veterans of Foreign Wars. In October 2010 the soldier farthest to the left was added to include our female military, military of color and to represent the Coast Guard. 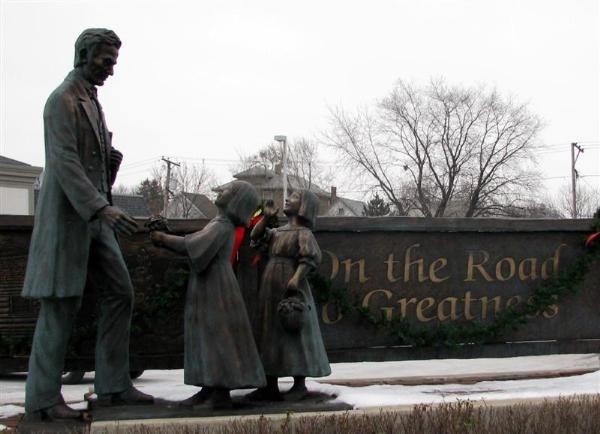 The fourth corner is the recent sculpture of Abraham Lincoln receiving flowers from two children entitled “Lincoln on the Road to Greatness”. The statue was dedicated in 2003, and was funded by private donations- including 200,000 pennies collected by local students. It is noted as one of few depictions of Lincoln smiling. In 1992 the Lincoln Highway Association reactivated and remains active in promoting the highway and its history. In 2000 Lincoln Highway became a National Scenic Byway.